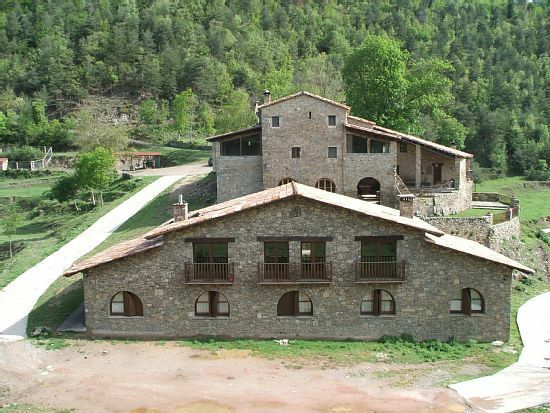 This magnificent Domus or strong stone house was built in the 11th century, in the Les Lloses Valley, 14 km away. of Ripoll. The house, in the middle of nature, is located on the hill of a farm of 165 hectares. of mountains, meadows and forests. It retains its original stone structure with Romanesque arches and vaults and large gardens. The wonderful walks around the farm are a great attraction to enjoy the aromas, sounds and colors of pure mountain nature. Restored in 2010, the interior has a quiet and cozy atmosphere thanks to a warm and pleasant decoration. The dining room with large windows offers spectacular views of the valley and its mountains, not to mention the delight of a good traditional meal, carefully prepared with natural products from the area, accompanied by a good wine. In the summer season you can enjoy refreshing baths in the crystal clear river that crosses the farm as well as the pool opened in 2015. And in the fall we take care of accompanying them to the mushroom-rich areas. Ideal for celebrations, conferences, business meetings and family celebrations.